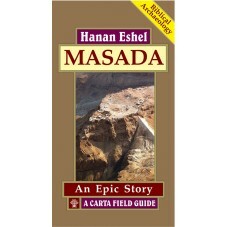 • Masada of the First Jewish Revolt whose refugees dwelled on the cliff top following the destruction ofJerusalem in 70 CE, until its conquest and occupation by the Romans three to four years later. Professor Yigael Yadin excavated the famous Masada during the mid-1960’s and the results of the excavation gives a poignant picture of these three salient periods of Masada’s occupation. This richly illustrated and easy to read gem of a book tells the whole story.